Keeping a close eye on freight and cargo loads is an important part of our business as a Midwest intermodal freight carrier. As the holidays envelop us, there may be more instances of cargo thefts. A recent report from logistics company FreightWatch Int’l. outlined 212 cargo thefts that occurred in the U.S. in the last recorded period (76 thefts in August, 84 in September, and 52 in October). According to the FreightWatch Int’l. 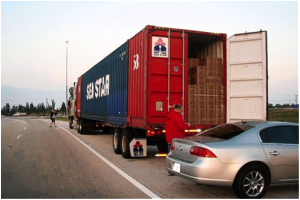 report and detailed in a TruckingInfo article, cargo losses per incident totaled about $256,586 per theft. The number of thefts were lower, but the average dollar value of the losses increased dramatically by 58 percent. Almost a quarter of the thefts (22%) were food and drink cargo loads, and cargo thieves apparently were targeting meats, cereals, soft drinks and dry foods. Electronics cargo loads with TVs, computers, and computer accessories were the next highest raided, with 29 instances during the Aug-October period. The Freightwatch Int’l. report noted that the top 5 states with the highest number of cargo thefts were California, Texas, Florida, Illinois and Georgia. In these states, about 75 percent of the incidents occurred, mostly from cargo loads in unsecured parking areas. The report noted that there were 157 container and trailer theft incidents, making these the most common type of theft (75%) of period total. The numbers for the full year 2013 are not yet available, but there were almost 950 U.S. cargo theft incidents in 2012. That was the highest number of theft incidents on record for the cargo industry in the US. Calhoun Truck Lines is vigilant about the protection of our cargo loads and our drivers in the area of cargo theft. With a combination of training and trucker best practices, we are able to keep any cargo theft that may occur to a very low percentage. Protection and preparation are key tools to use against cargo theft.